Top Shop/Top Man has long been the London Go-To for fashion-forward basics. Their collection of Hip Suits, Jeans, Shirts, Hoodies, Vests, Tanks and Tees are superior to it's rivals. H&M and Banana Republic better step it up! Bring your student ID 10% OFF. Even bottoms like Top Man! Stumbled on this fantastic shop on my last NYC trip and fell in love. Great clothes, not super expensive, and sizes ranging from XXS to XXXL! They seem to have something for everyone, although definitely with a hipster vibe. Suits, ties, tees, jeans, button downs, shoes... you could get a whole wardrobe if you wanted! Finally finally finally! I've had to hop to the other side of the pond for years in order to get my fix. Thank you Kate Moss for bringing the goods over here. 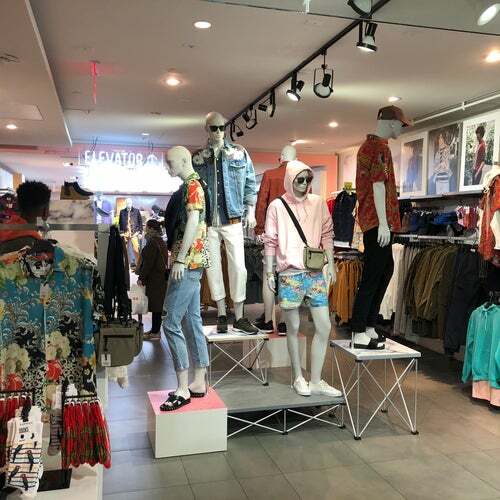 The mens stuff is all downstairs with a great selection of fashionable clothes and accessories. this place is pretty cool.